"I am not a politician; I am a public servant," states Kurt Wheeler, mayor of the Village of Cazenovia. From ROTC as a student, to active duty in the US Armed Forces, to high school teacher, and now to holding local public office - Wheeler is a man who has been dedicated to public service his whole life. Growing up and spending most of his time in Cazenovia, Wheeler is accustomed to the atmosphere and needs of the area. Wheeler has been the village mayor since being elected in 2011. 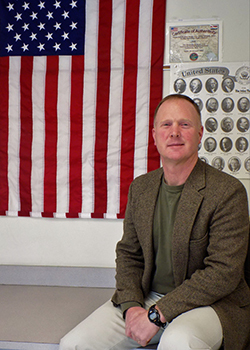 He is also a history teacher and cross-country coach at Cazenovia High School – where he has worked for the last 20 years, and is raising a family in the village. Although he never anticipated becoming mayor, Wheeler states that "elected office was an evolution of public service." Wheeler cites giving back to the community, promoting thoughtful economic development, and keeping Cazenovia a desirable place to live as his main motivations. "I moved back here to raise my family and I hope, in the future, my daughters will do the same," says Wheeler. He makes clear his continuing commitment to serve all residents of the diverse population of residents living in the village, and states that it is easier to relate to the population due to the fact that he has grown up here and experienced all aspects of the town. Currently Wheeler is heavily involved with the planned commercial development of the plot of land on Route 20 in the eastern part of the village. This is the site for a proposed new development, which includes an ALDI’s food market. He is also working on a cooperative initiative between the Town of Cazenovia and the Village in order to consolidate the two layers of government. Wheeler also works closely with Cazenovia College administrators, including the College's new president, Dr. Ron Chesbrough. Wheeler is pleased that members of the town were consulted in regards to the College's search for a new president and given the opportunity to provide their input. Wheeler comments that the relationship between the College and the local community continues to improve under Chesbrough’s leadership. As an example of this improvement, a memorandum of understanding between the Cazenovia Central School District and Cazenovia College has been enacted. The agreement allows Cazenovia High School students access to one class a semester at the College for a reasonable price, provided there is space available. With this opportunity in place, Cazenovia High School students may earn up to three college credits per semester. Possibly just as prominent a figure in the community as the mayor is his family's cat, Cooper. The fearless feline can often be seen wandering around the village, the campus, or in the local establishments. When asked if he or his family ever worries about Cooper, the mayor responds "You really can't. We get calls all hours of the night about Cooper. He always finds his way home and definitely has nine lives." The mayor explains that Cooper was found as a stray and then adopted by their family. By their best guess he is around five years old. Cooper uses the mayor's home as a safe spot if he needs food or a warm place to stay, but is far too much of a social cat to be confined to one house.